Overall, the weather has been windy and rainy, not conducive to much outdoor activity. 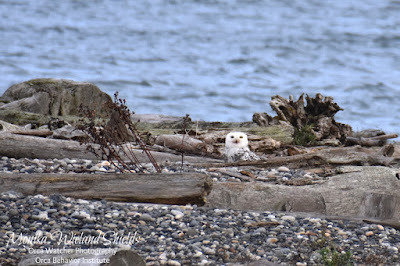 It hasn't stopped us from getting out there completely, as a couple weekend ago we went off island to do some birding, and successfully saw two different owl species. 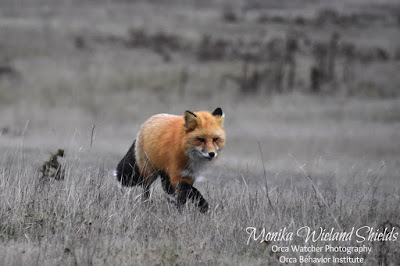 With some family visiting over the Thanksgiving holiday, we went down to check out the foxes at South Beach. 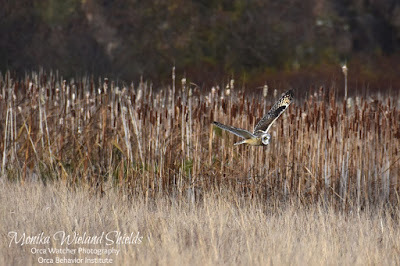 This one provided a welcome splash of color in an otherwise very gray landscape on a very gray day! We've also been able to do a lot of bird-watching from the comfort of our own home due to some very active bird feeders, which we have been keeping a closer eye on than usual with the start of Project FeederWatch. 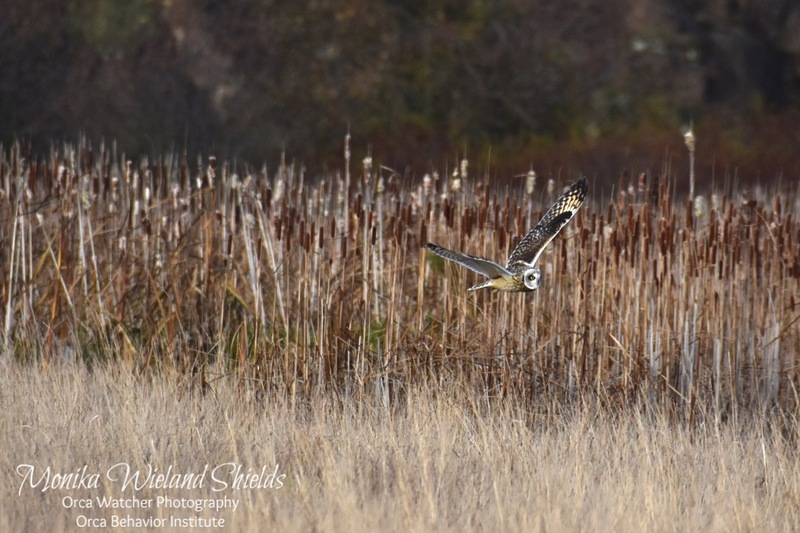 Thanks to the counts we've been doing, we realize we get visits from about a dozen species a day totaling about 60 birds! The vast majority of these are a huge flock of juncos, but we also regularly get visits from four different species of woodpeckers. 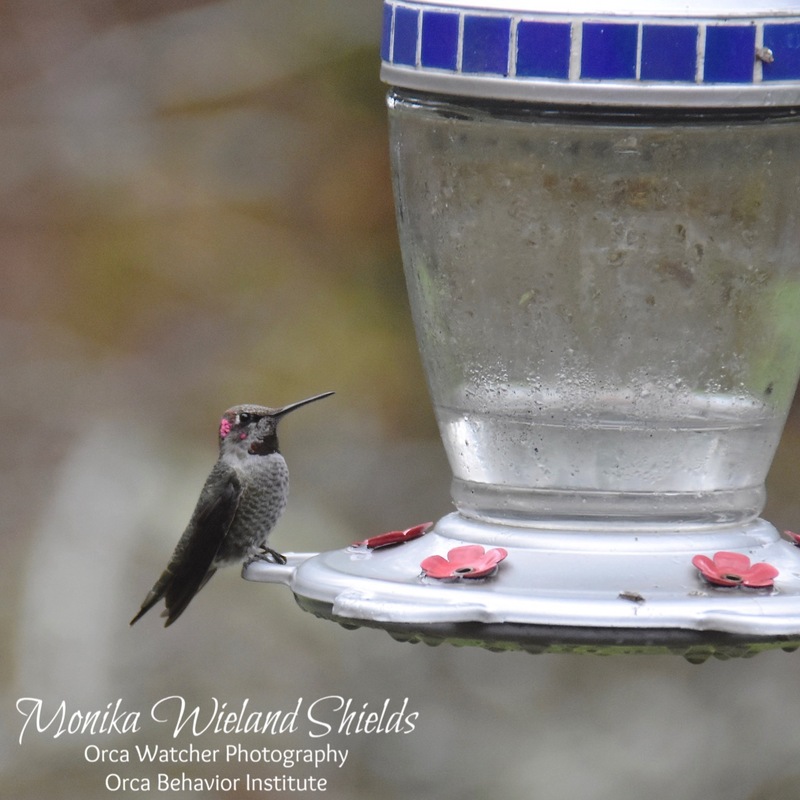 Anna's hummingbirds have been steadily expanding their year-round range northward over the last couple decades. 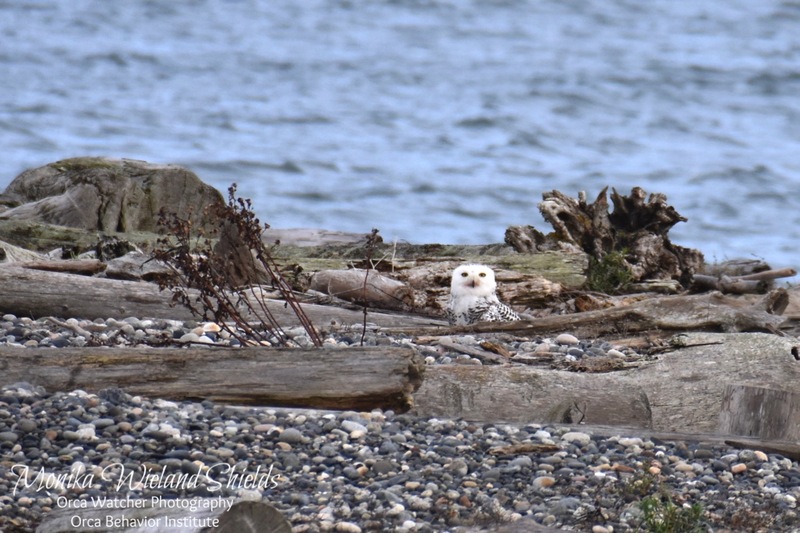 Ten years ago it was rare to have one overwinter on San Juan Island; now, it's commonplace. 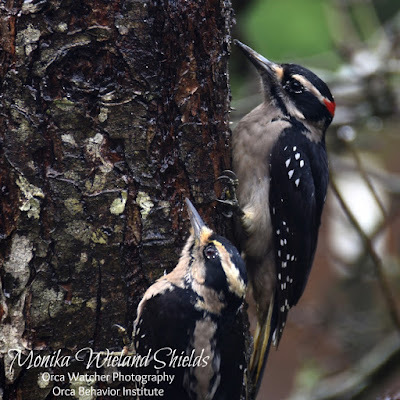 For the first time I'm getting them as regular visitors to our feeders during the winter. How do they survive without blooming flowers? These adaptive little guys eat insects and sap - though they aren't above sugar water, either! Anna's hummingbird - in December! 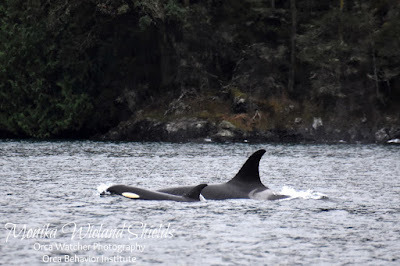 This afternoon (December 2nd) we got word of orcas in San Juan Channel. They were heading away from us, but a bit later a friend on shore saw them turn around, so we headed out to Reuben Tarte county park to take a look. A few others were already there looking, and surprisingly, the first whales they pointed out to us were a pair of humpbacks! 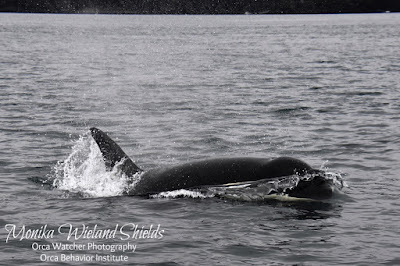 Shortly thereafter we spotted three orcas in the distance heading down San Juan Channel. They were spread out and far away, but since we didn't see any others, we assumed they were transients. Later in the afternoon, however, we got a chance to hop aboard a boat out of Friday Harbor with Maya's Legacy Whale Watching. 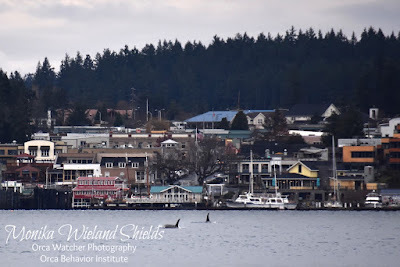 We thought we needed to go a ways to catch up with them when I spotted a whale right near Point Caution just north of Friday Harbor. I zoomed in on the first photo I took and spotted a large "finger" on the saddle patch - something you don't see on transients! 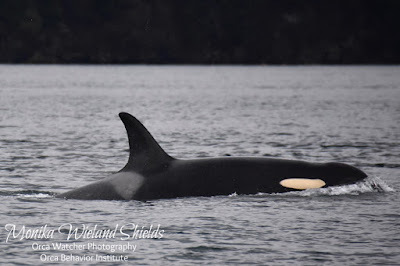 It was J17 Princess Angeline and her youngest J53 Kiki. The whales were very spread out both north-south and across the channel, but slowly more and more came into view. It's amazing the energy and mood boost that comes from seeing whales, especially apparent this time of year when the winter dolrums have set in. As the daylight was fading the last two whales we saw approaching were L87 Onyx and J45 Se-Yi'-Chn. 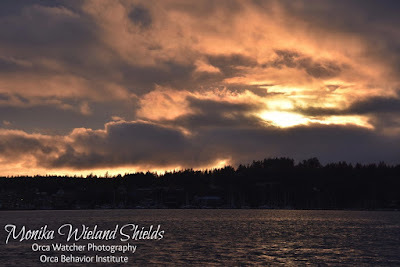 The colors of the sunset were becoming more spectacular and we were all crossing our fingers for a perfect surfacing from them in the amazing lighting. Of course, right when the sky looked like this they took a long dive. Beautiful winter sunset....but what happened to the whales? 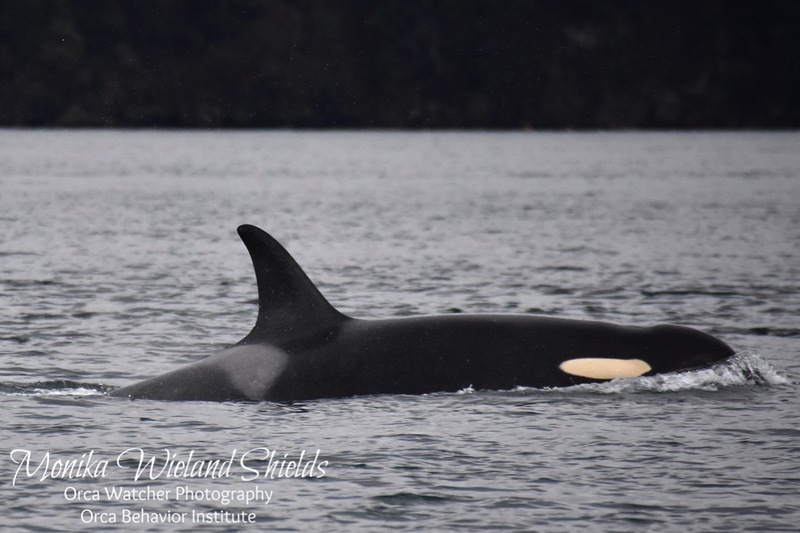 After surprising us by doubling back, we did finally get a look at the big male Onyx in front of Friday Harbor. The light had changed by then, but I'm not complaining - at least it wasn't dark yet! 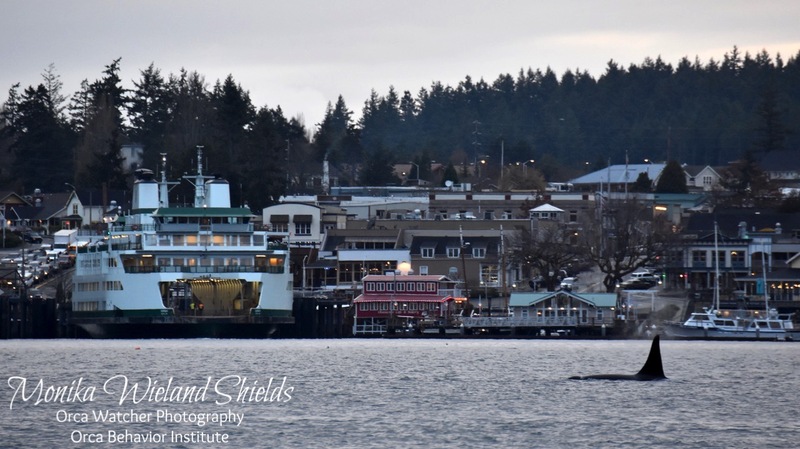 It was pretty awesome to see him right off the Friday Harbor ferry terminal, complete with ferry at the dock! 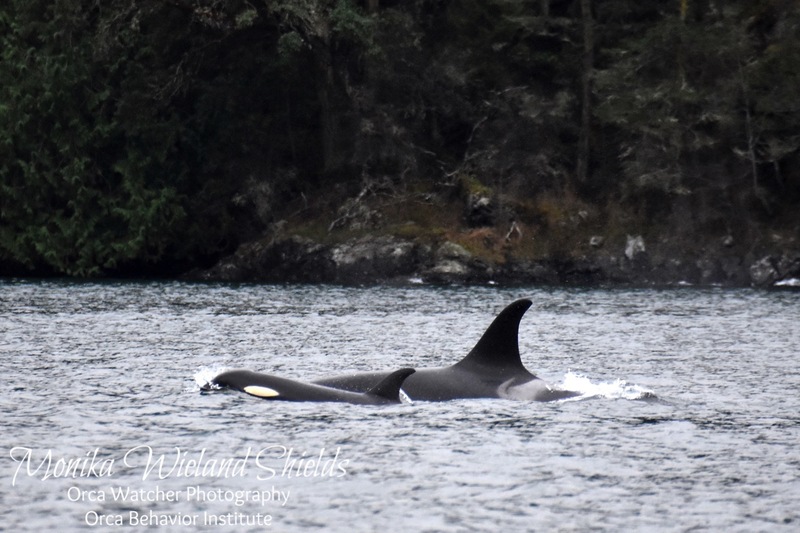 Unexpectedly seeing J-Pod and L87 was a thrill that helped make up for the long stretch of dreary days. Luckily it looks like there's a lot of sunshine in our near future, so hopefully I will have more photos to share again before long! Fantastic! Birds, whales and a fox. Life is good.